ON APRIL FOOLS’ Day, the House of Commons will debate an online petition that calls for the Brexit process to be reversed, which has gathered over 5.7 million signatures. The e-petition calls for Article 50 to be revoked; Article 50 is the clause that allows a member state to leave the European Union. The debate is scheduled for next Monday, 1 April. In December, the European Court of Justice ruled that the UK had the power to revoke Article 50, thereby halting its withdrawal from the EU. This would have to be done before actually leaving – it couldn’t be revoked after that. 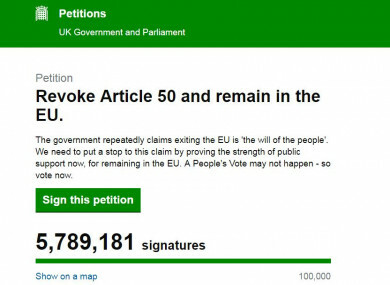 The petition has gathered a record level of interest, and caused problems for the UK parliament’s e-petition website after it was first uploaded. The level of reaction led to accusations of “fraud and overseas signatures”, the Petitions Committee said, adding that 96% of the signatures on the petition were from the UK. The House of Commons pledges to consider all petitions that get more than 100,000 signatures for a debate in the chamber; and responds to those that get over 10,000 signatures with a statement. The Department for Exiting the European Union added that revoking Article 50 would “undermine both our democracy and the trust that millions of voters have placed in Government”. “As the Prime Minister has said, failing to deliver Brexit would cause ‘potentially irreparable damage to public trust’, and it is imperative that people can trust their Government to respect their votes and deliver the best outcome for them,” it said. Email “MPs to debate reversing Brexit next Monday, after 5.7m people sign petition”. Feedback on “MPs to debate reversing Brexit next Monday, after 5.7m people sign petition”.